Simply the Best New England Clam Chowder uses Gourmet Chopped Sea Clams, which features its great piece identity and robust juice flavor. True chowder traditionalists prefer thin brothy milk chowder served with crackers to allow the patrons to make it as thick or thin as they like. 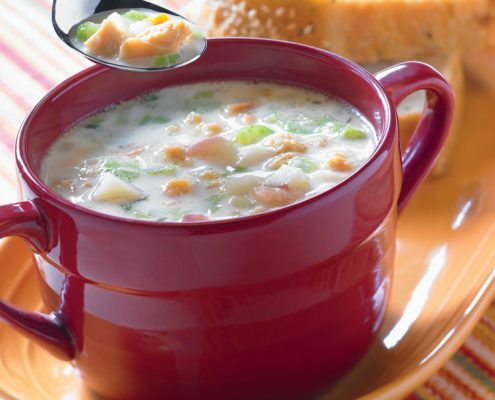 The most well known clam chowder across the country is New England Clam Chowder a cream based chowder with clams, potatoes and onions. This chowder was first made on ships coming from Newfoundland all the ingredients were readily available and made enough to feed them and their families. 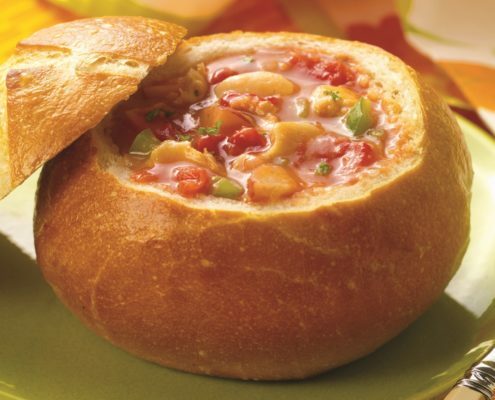 Tomato based clam chowder became popular in the mid-1800’s with the large population of Italians in NY and the Portuguese immigrants in Rhode Island. Just combine tomatoes, onions, peppers, celery and a little bacon to make this refreshingly different chowder. 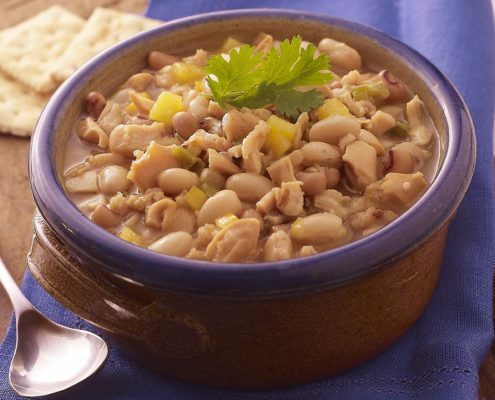 You have heard of New England Clam Chowder, Manhattan clam chowder and now it is time to try Hatteras Clam Chowder. This classic chowder is easy to prepare with fresh potatoes, celery, onions, carrots and thyme all cooked in clam juice. 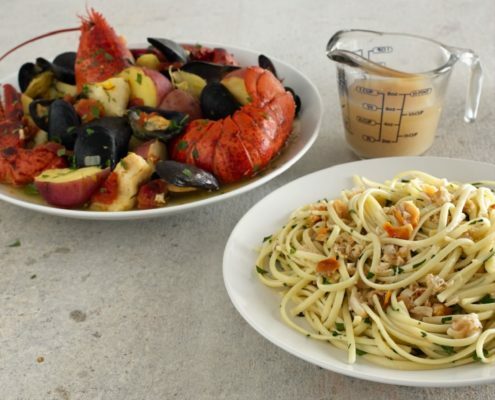 Then just add the chopped clams for this lighter version of a traditional favorite. In sauce pot combine clam juice and chili paste and simmer. Add raw seafood simmer until cooked through. Add soy sauce and sesame oil stir to combine. Portion 8 oz of soup into 6 bowls and add cooked seafood in each. Garnish with the sliced onions before serving. 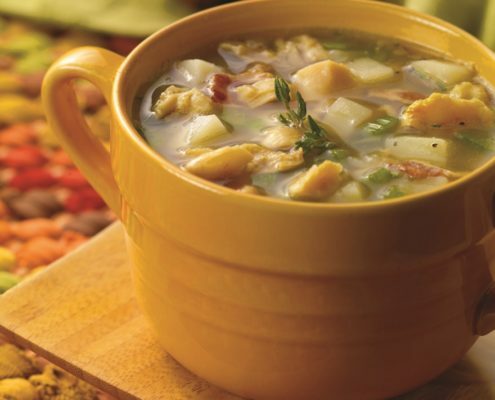 Cabo Clam Chowder is a combination of north and south of the boarder. Tender clams with a touch of chipotle cooled by a squeeze of lime. The baja peninsula is the perfect place to enjoy this chowder or anywhere when you wish you were in cabo. 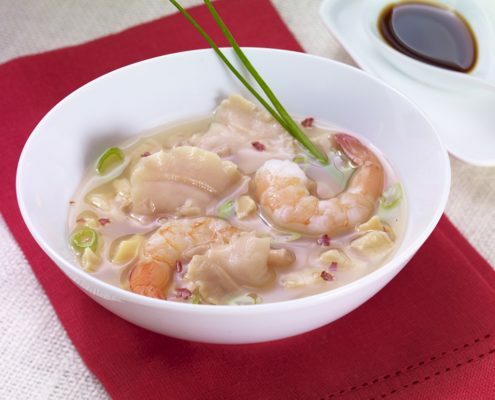 Is a classic French shellfish and fish stew prepared using a variety of seafood, onions, tomatoes and saffron. 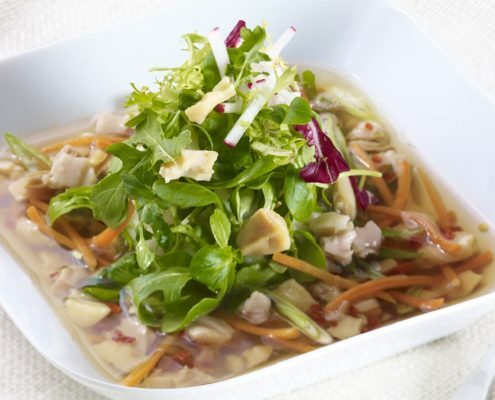 The flavor is heightened in this stew by using our concentrated clam juice. 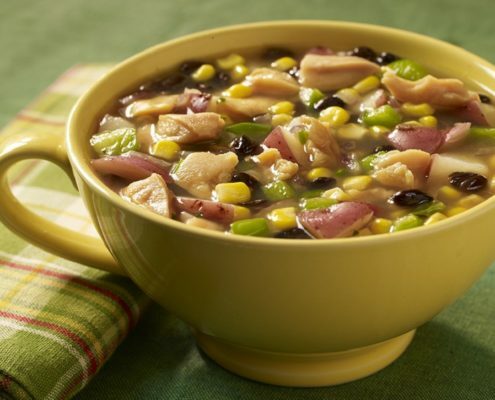 Serve with toast points to soak up the goodness of this stew. © 2017 Sea Watch International. All Rights Reserved.